Compounding is the mixing of drugs by a pharmacist to fit the unique needs of a patient. There are many medically necessary reasons this may need to be done. A patient may be allergic to a non-essential ingredient, such as a preservative, that is in a brand name product. A pharmacist can start from a powder form of the medication and make this drug without the ingredient that the patient is allergic to. Also, if a patient cannot swallow a pill, the compounding pharmacist can change the dosage form to a liquid or possibly a transdermal gel. Another very important reason is if the patient needs an exact dose of a medication and it is not commercially available. Finally, it may just be to add flavoring to a medication that just does not taste good. How do I find a Doctor that Writes for a Compounded Medication? Any licensed medical doctor can write for a compounded prescription. Many physicians may not be accustom to writing a prescription that is not commercially available. At Village Compounding Pharmacy we pride ourselves on providing and communicating with all health care practioners to assist in finding the best preparation for your needs. 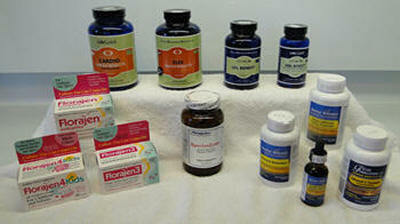 We can also supply you with doctors who commonly prescribe compounded prescriptions. How Do I Get My Prescription to You? How do I pick my Medication up? Once your prescription has reached our pharmacy, we will contact you and request the following information: Name, Address, Phone number, Drug Allergies, Method of pick up. You may pick your prescription up at our Warrington, Pa location or we can ship your prescription via UPS or USPS. We ship out packages Monday-Friday. UPS shipping is $9.50 and USPS shipping is $7.50; if it needs an ice pack, the charge is $10.50. We will require a credit card over the telephone, and your current mailing address. Allow an extra one to two days to receive your medication. If you will be having your medication administered in the doctors office, we can ship the medication to the office, or they may pick it up at our pharmacy. If I am a physician, how do I write for a Compounded Prescription? A compounding pharmacist will always be available to discuss specific questions you may have when prescribing a compounded medication. Since your medication is a customized formulation, the cost of your medication will vary depending on your prescription. We will contact you before we make your prescription to notify you of the cost. We do not take insurance plans at the pharmacy , but we will be more than happy to supply you with a reimbursement form that you can submit directly to your insurance company. We will gladly accept: Cash; Credit Card (Mastercard, Visa, AmEx, Discover); or Personal Check.